As one of the world's top endurance athletes, an Iditarod sled dog has extremely specialized dietary needs. Requiring a diet of nearly 10 times the calories of a non-working dog and huge amounts of protein and fat, the Iditarod sled dog must be carefully fueled. While calorie needs vary from sled dog to sled dog, a rough estimate by the Iditarod Sled Dog Racing Association notes that a dog at peak race times can consume and burn up to 10,000 calories a day. Younger dogs, faster dogs, and heavier dogs burn more. During the offseason, a sled dog may only consume 800 calories. No dog can eat 10,000 calories at once. Therefore, the dog must be fed several times throughout the day. Fat makes up the primary portion of a sled dog's diet. It has more than twice the amount of calories as any other nutrition source, making it easier for the dog to get the calories he needs in a smaller, denser form. Sled dogs in peak condition easily require a diet consisting of 50 to 60 percent fat. This gives them a ready source of energy, an ability to stay warm and consistent energy levels. Protein is crucial for muscle growth and maintenance. While the primary source of energy for a sled dog is fat, protein provides the quick "get up and go" source of energy. Protein works in dogs much like carbohydrates work for humans. Just like humans, dogs need a variety of minerals and vitamins. Of special interest to sled dogs are the B vitamins and vitamin E. B vitamins provide energy and help the brain and muscles communicate. A deficiency in any B vitamin can cause lethargy, seizures and clumsiness, none of which is welcome in an Iditarod sled dog. Vitamin E helps the sled dogs maintain their body heat and gives them healthy fur, skin and pads. Sled dogs' feet taking a brutal beating from running every day. Vitamin E helps their body repair the damage. Nothing that a sled dog eats matters if that dog isn't properly hydrated. A dog can run without food but he absolutely cannot function without water. Sled dogs cannot "eat snow" in order to stay hydrated because it takes a significant amount of energy and calories to melt the snow and get any substantial amount of water. 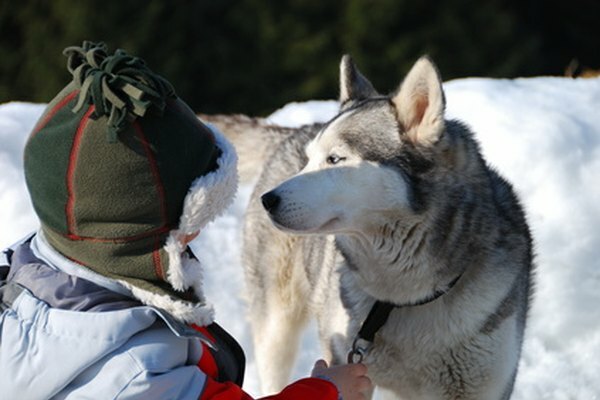 Sled dogs must be offered clean, fresh water as often as possible. Why Can't an Emu Fly?